There are only so many ways a review can go. There’s the long, slow, sloppy, wet kiss; the brutal takedown piece; the analytical, death-by-many-cuts; and the ever-popular “I’m an amazing writer, aren’t I?” There are more, but not many—this review is one of those others: the reconsideration after they let the air out of the balloon. Once upon a time, Dumpling Inn was a cult Chinese spot hiding in a troubled strip mall (4619 Convoy St.) around the corner from Jasmine Restaurant, one of San Diego’s great dim sum palaces. Its hip hole-in-the-wall cachet, Northern Chinese menu and perfect execution made it a hot Convoy favorite about a decade ago. By 2011, though, the chef / owner had opened a new East Village spot, and it seemed that much of his attention was lavished on this new baby. Dumpling Inn suffered. With the East Village place gone and the focus back on Dumpling Inn, I returned. First to arrive at my table were the potstickers, the gateway drug to Chinese dumplings. Potstickers often disappoint, with dried morsels of pork inside a too-thick, desperately dry wrapper. The hard sear that gives the dish its name has more ways to go wrong than right. But Dumpling Inn’s version was not only the best potstickers I’ve had in San Diego, on three separate trips they were the best potstickers I’ve had anywhere. The caramelization on the bottom was perfect, and the meat profoundly juicy. While Dumpling Inn’s xio long bao might not quite reach the heights of the potstickers, they are easily the best soup dumplings I’ve tried in San Diego. Where xio long bao wrappers are so often hard, these were supple with a hint of elasticity. Where they are so often cracked, allowing the precious “soup” resulting from the melted gelatin in the filling to be lost, these dumplings were gloriously whole. The filling was meaty and moist, with the moisture coming largely from gelatin rather than fat. 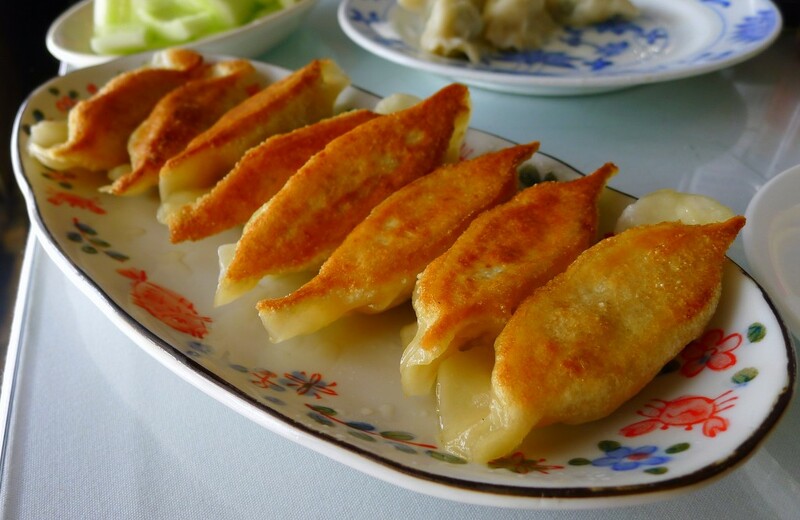 There are a number of other dumplings on offer: boiled, steamed and deep fried. The pork / chive and shrimp / chive boiled dumplings were particularly good. These are not the elegant, pleated affairs of the dim sum parlors of China’s south; rather, they’re hearty fare from the colder north. They’re Asian cousins to Eastern European pierogis or piroshkies. Dumpling Inn offers more than just dumplings, though the cold sides are unremarkable. Pickled cucumbers were barely pickled, and the sliced, stewed pork tongue was dry and nearly flavorless. The cold-appetizer bar at any of the local Sichuan restaurants offers better. The kung pao chicken was better, with a vibrant hint of plum in the sauce. The sea bass with black-bean sauce was perfect; the sauce complemented, rather than dominated, the dish, just clinging to the pillowy fish and little wedges of stir-fried onion and green pepper. But it’s the dumplings that call my name. The long lines that used to be Dumpling Inn’s greeting—a consequence of the restaurant’s pillbox dimensions (though a move into larger quarters next door is in the works)—are back. Thankfully, so, too, are the perfect dumplings.